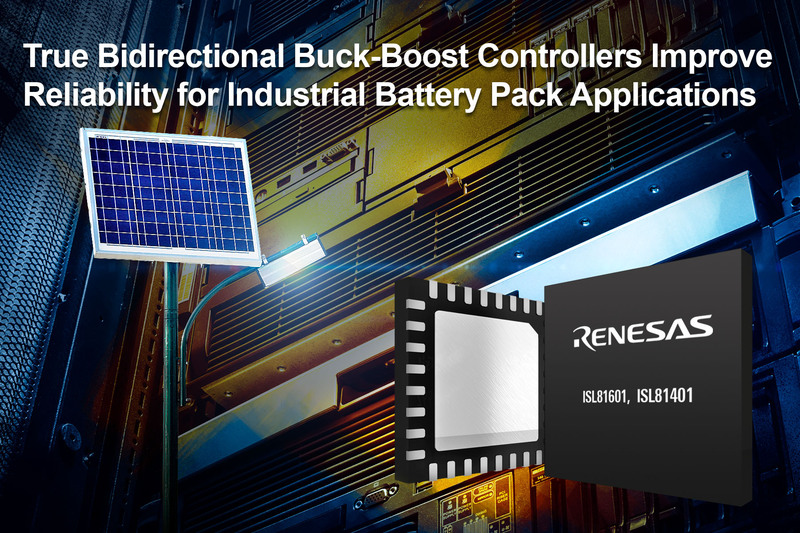 Renesas Electronics Corporation (TSE:6723), a premier supplier of advanced semiconductor solutions, announced an innovative new family of bidirectional four-switch synchronous buck-boost controllers. The ISL81601 and ISL81401 are the industry’s only true bidirectional controllers that sense peak current at both ends and provide cycle-by-cycle current limit in both directions while in buck or boost mode. The controllers generate point-of-load (POL) and voltage rail conversions with peak efficiency up to 99 percent. The ISL81601 has a wide input range of 4.5V to 60V and produces a 0.8V to 60V output to support most industrial batteries: 12V, 24V, 36V and 48V. Also available is the ISL81401, a 4.5V to 40V input and 0.8V to 40V output version, and its unidirectional counterpart, the ISL81401A. The new controllers are well suited for DC power backup and battery-powered medical, industrial and telecommunication systems. The ISL81601 and ISL81401/A can be combined with a Renesas RL78 microcontroller (MCU), or other MCUs, to program the voltages, battery charge/discharge function, and on-the-fly bidirectional power flow. Designers can also use the PowerCompass™ tool to help them quickly identify other power supply parts that match their specific system requirements. Multiple power rails can be set up and designers can perform high-level system analysis and generate custom reference design files in minutes. All three controllers and evaluation boards are available now from Renesas Electronics’ worldwide distributors. The ISL81601 bidirectional 60V synchronous buck-boost controller is available in a 38-lead HTSSOP package priced at $3.99 USD, and a 32-lead QFN package priced at $3.69 USD, both in 1k quantities. For more information, please visit: www.renesas.com/products/isl81601. The ISL81401 bidirectional and ISL81401A unidirectional synchronous 40V buck-boost controllers are available in 32-lead QFN packages. The ISL81401 is priced at $2.79 USD, and the ISL81401A is priced at $2.29 USD, both in 1k quantities. For more information, please visit: www.renesas.com/products/isl81401 and www.renesas.com/products/isl81401A. (Remarks) PowerCompass is a trademark of Renesas Electronics Corporation. All names of products or services mentioned in this press release are trademarks or registered trademarks of their respective owners.